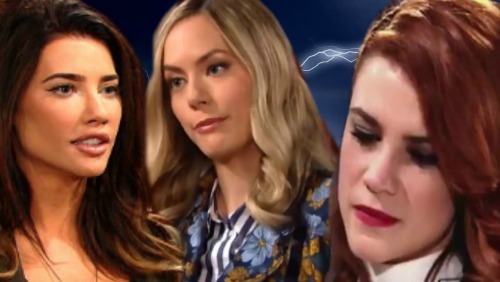 The Bold and the Beautiful (B&B) spoilers tease that one star is on her way out at the CBS soap. There’s been buzz for weeks about Courtney Hope’s potential departure as Sally Spectra. The writing’s been on the wall ever since Annika Noelle (Hope) debuted and Sally’s storyline quickly evaporated. Hope remained positive about the situation and added that “hopefully Sally can return to ‘Los Angeles Fashion’ soon.” It sounds like she’s on board if B&B ever wants her back for a fun stint. Of course, it seems likely that Sally will ride off into the sunset with Thomas (Pierson Fode) for now. They should be leaving town together as planned. Hope wanted everyone to know how much she’s enjoyed playing Sally on The Bold and the Beautiful. “It’s been the greatest year, and I will forever be thankful for my time as Sally Spectra,” Hope said.” She indicated that she’s “grateful for the memories and friendships” she’s made thanks to her soap journey. It’s certainly been a wild ride for Sally! Many B&B fans will be bummed to lose Sally, but her run was fun while it lasted. The Bold and the Beautiful spoilers say some fantastic storylines are still to come, so there’ll be plenty of material to entertain us. Who knows? Maybe Sally will pop up again at some point in the distant future. Will you miss Courtney Hope as Sally? Are you anxious to see what Hope does next? We’ll give you updates as other news comes in. Stay tuned to the CBS soap and don’t forget to check CDL often for the latest Bold and the Beautiful spoilers, updates and news. The Bold and the Beautiful Spoilers: Will Truce Last Between Thorne and Ridge – Brother’s Maintain Peace or Battle Again?